A person who is called a Certified Nurse Aide (CNA) in other states is called a State Registered Nurse Aide (SRNA) in Kentucky. The agency responsible for administration of the SRNA certification process is the Kentucky Cabinet for Health and Family Services-Department for Medicaid Services (Cabinet). New nurse aide applicants follow a process for becoming a SRNA that includes completing a training program and passing a competency evaluation examination. There are other paths for certain people, like nursing students. The following sections discuss paths to SRNA certification, training requirements, program selection and maintaining certification. There are several paths to becoming a SRNA in Kentucky. Most individuals are first-time students seeking certification and must complete the entire training and examination process. The state does have several other paths for nursing students and people who obtained training elsewhere. Therefore, the steps to certification begin with a review of the various paths to ascertain the route that best fits personal circumstances. Certification requirements for a new nurse aide state the individual must complete the Nurse Aide Training and Competency Evaluation Program (NATCEP) in order to get listed on the Kentucky Nurse Aide Registry (Registry). That means the person must successfully complete a state-approved training program and pass the competency evaluation examination. 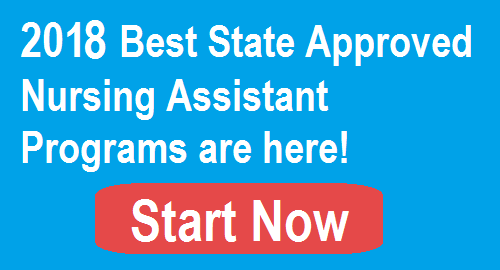 If someone completed nurse aide training in another state, but did not take the CNA exam and is not listed in that state’s Registry, he or she will have to take the out of state exam and get their name on that state’s Registry. Only then can out of state CNAs apply for reciprocity in Kentucky. Nursing students who successfully completed a nursing fundamentals course in a Licensed Practical Nurse or Registered Nursing Education program within the prior year (12 months) can apply to take the competency examination without going through nurse aide training. Also, individuals who are foreign nurses or military trained nursing assistants (or equivalent) can request permission from the Cabinet to take the competency evaluation examination with retraining. Option one: Attend a school offering a SRNA training program. A state-approved training program must consist of at least 75 hours of training, of which 16 hours are supervised clinical training. Option two: Work in a Medicare or Medicaid funded long-term nursing care facility while training. A student can work in the facility for no more than four months (120 days) without registration. In both options, the trainee in any clinical setting must work under the supervision of a Registered Nurse (RN) who has at least two years of nursing experience. One year must be employment in a long-term care facility. The trainee can also work under the supervision of a Licensed Practical Nurse (LPN) who has at least one year of work experience. There are over 20 SRNA programs in Kentucky, offered in a variety of facilities that include community colleges, career and technical education schools, nursing facilities, Kentucky Community and Technical College (KCTCS) facilities, universities, private licensed educational facilities, nonprofit and church-related educational facilities, and long-term nursing facilities. It is important to attend only a state-approved training program. The state says students should always verify the program’s status and to be cautious about offers of home training programs because most are not state-approved. A training program can be completed in a short two or three-week timeframe. The class costs at Kentucky Community Colleges, and Kentucky Community and Technical Colleges (KCTCS), are similar from program to program. For example, Ashland Community & Technical College charges $492 plus $11 for liability insurance. However, the student must also purchase a textbook for $102.80, scrubs, tennis shoes and medical supplies. There will also be testing fees. The Bluegrass Community & Technical College charges $596 for the course fee, malpractice insurance, state testing fee, mandatory per credit hour fee and an estimated $110 for books plus $40 for a security fee. In comparison, the University of Kentucky charges $517 for tuition, and the student must also purchase the textbook and clinical suppliers, and pay testing fees. Kentucky Healthcare Training charges $600 for tuition, study guide, background check and malpractice insurance. Students must still buy a textbook and uniform, and pay for a state testing fee and TB skin test. A nice feature is that classes are offered during the daytime, nighttime and weekends. There is also an online training option which also costs $650, but there is still a requirement to complete clinical training. To compare costs, make sure all expenses are considered. Students can get free training in certain circumstances. Federal and state laws require nursing facilities to cover the costs of nurse aide training and competency evaluation examination. Also, if someone is a SRNA and employed by a nursing facility within 12 months of passing the competency evaluation examination, the facility must reimburse the employee for training and exam costs. Financial aid is normally not available for CNA training, unless it is a credit course. However, the financial aid office may know of private scholarships, grants or state workforce training funds that are available. It is always wise to make inquiries. Basic nursing skills, i.e. taking and recording vital signs, caring for the resident’s environment, measuring and recording weight and height, etc. Personal care skills, i.e. grooming, dressing, feeding, transfers, positioning, etc. Delivering basic restorative services, i.e. use of assistive devices, care and use of prosthetics, etc. Written or Oral Examination – This part of the exam consists of 75 multiple choice questions. The student must score a minimum 70 percent to pass. Skills demonstration – This part of the exam consists of five tasks and will include required personal care skills, like handwashing. The student must score at least a 70 percent. All of the questions and skills come from what was taught in the SRNA training program. Each person is allowed three attempts to pass both parts of the competency evaluation exam. Applicants are required to take the competency exam within one year of completing training or the fundamentals of nursing course. The Kentucky Board of Nursing maintains the state Nurse Aide Registry (Registry). The KCTCS forwards the names of applicants who successfully completed the NATCEP to the Registry. The SRNA status can be validated through this link. The initial SRNA certification in Kentucky is valid on the Registry for two years from the date the competency exam was passed, and every two years after that. To renew SRNA certification, the SRNA must prove he or she worked for compensation for a minimum of eight hours during the prior 24 months (two years) as a nurse aide. If the registration is allowed to expire or lapse, and the individual did not work eight paid hours during the certification period, it is necessary to retrain and retest. Also, the nursing facility must provide at least 12 hours of staff development (in-service) each year of the 2-year certification period, maintaining documentation for state review when requested.